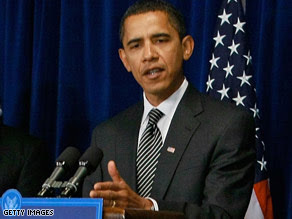 President Obama went to the House today to meet with Republican counterparts to talk about his $825 billion economic recovery plan. He stipulated that it will include tax rebates for nearly all working Americans. Obama was asked if there could be any negotiations on the structure of the biggest tax cut in the bill. He stood tall and stated "Feel free to whack me over the head because I probably will not compromise on that part," the president replied according to one of the aides. Even if people do not pay income taxes, Obama believes that these people are paying payroll taxes for Social Security and Medicare. He met with the House Republicans and also with the Senate GOP caucus. He listen intently for approximately 2 hours and admitted "There are some legitimate philosophical differences" between Democrats and Republicans on how to stimulate the economy, Obama noted, "and I respect that." He doesn't expect 100 percent agreement on his economic package, but he would at least hope that the Senate Republicans could put politics aside and do what is right for the country. In this editors opinion, I believe that the economic stimulus bill should pass and needs to be ready for signing no later than the middle of next month. Quick confirmation of the bill is essential. But, I truly believe that President Obama needs to get someone to manage the money allot better than President Bush did with the first part of the TARP money. Now, Treasury Secretary Mr. Geithner will be in charge of distributing the rest of the TARP money. Mr. Bush's Treasury Secretary did not manage the money well.